Another of Alton Towers' classic rides left the park at the end of 1997. The New Beast, has a pretty vague history about it. Some say that in the early nineties, the Black Hole underwent a bit of an overhaul inside the tent, and the whole track was removed, and replaced. The removed track was then taken to Thunder Valley, and re-constructed as the New Beast. Other say that, when the Alton Beast, and Mouse where removed from Talbot Street, the Beast was moved into this new area. Of these two theories, the second is the most probable, as the New Beast arrived the year the Alton Beast was removed. For some years it sat in Thunder Valley, under the shadow of Thunder Looper. 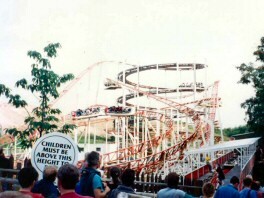 Then, in 1994, when Nemesis arrived, still the New Beast managed to remain popular, until 1998 when it was removed, to make way for Air's construction which started in 2000. The ride itself was very similar to the Black Hole, with a long spiral climb to the top, with a steep drop immediately after, followed by lots of fast sweeping bends.